Packed with good information, this guide gives a translation of horse-talk for understanding every neigh, nod, and nicker. 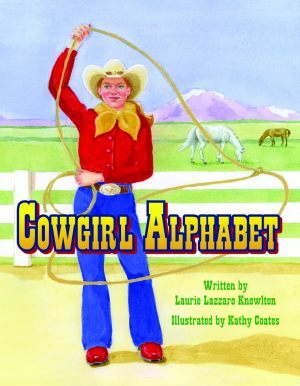 Other valuable resources include the cowgirl’s code of conduct, a list of uses for a kerchief, and instructions on heeling a cow and reading a brand. Every gal with an air of confidence and a zest for life has the makings of real cowgirl. The rest is in the details, from A to Z.
Laurie Lazzaro Knowlton is a full-time author and speaker with more than forty books. Her first children’s title, Why Cowboys Sleep with Their Boots On, has sold more than 40,000 copies and received the Premier Print Award from Eastman Kodak. A former elementary school teacher, she now gives presentations on an international level at trade shows, schools, libraries, and conferences. She is author of Why Cowboys Need a Pardner; Why Cowgirls are Such Sweet Talkers; Why Cowboys Need a Brand; Nana’s Rice Pie; and Red, White, and Blue. Knowlton is the mother of two cowgirls of her own and when she’s not working, she loves kickin’ back on her ranch, Roots n’ Wings in Medina, Ohio. Kathy Coates is a freelance illustrator and painter whose work is displayed in galleries across the Southeast. She is a member of the Society of Children’s Book Writers and Illustrators, which purchased several of her illustrations for use in their bulletin. Coates is also the illustrator of Batty About Texas and The Buzz on Honeybees, both published by Pelican. She lives in Charlotte, North Carolina.